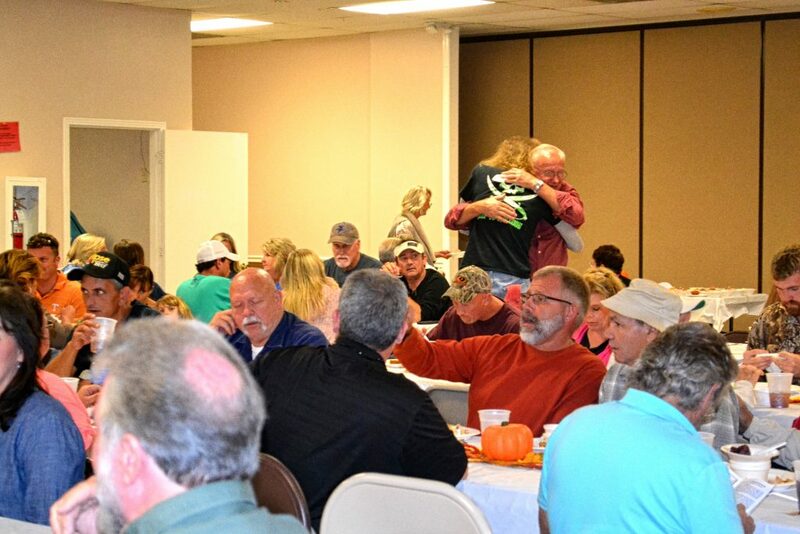 5th Annual Fellowship House Fund Raiser, Oct. 11. The 5th Annual Fellowship House fundraising dinner is set for the East-West Bldg. at the James E. Ward Ag. Center, Thursday evening, Oct. 11 at 6:00 P.M. This is the only fundraiser the Fellowship House, a transitional house for men, located at 206 S. College, holds. Funds are needed to continue expansion to keep up with the growing demand in Wilson County/Lebanon. Judge David Earl Durham will be a brief keynote speaker. The dinner this year, is dedicated to the memory of Dr. Larry Locke, former board chairman and longtime supporter of the FH. The dinner, consisting of fried catfish or chicken and all the trimmings is just $25 per plate and the total amount is tax deductible. “Last year, we had about 150-people attend.” Said FH board chairman, David Denney. “The dinner, our only fundraising event has continued to grow and is a huge success. But as Wilson County and Lebanon continue to explode in population, the demand for our services dictates that we expand. That takes money and this is our only way to raise funds. We are not subsidized or affiliated with an organization. 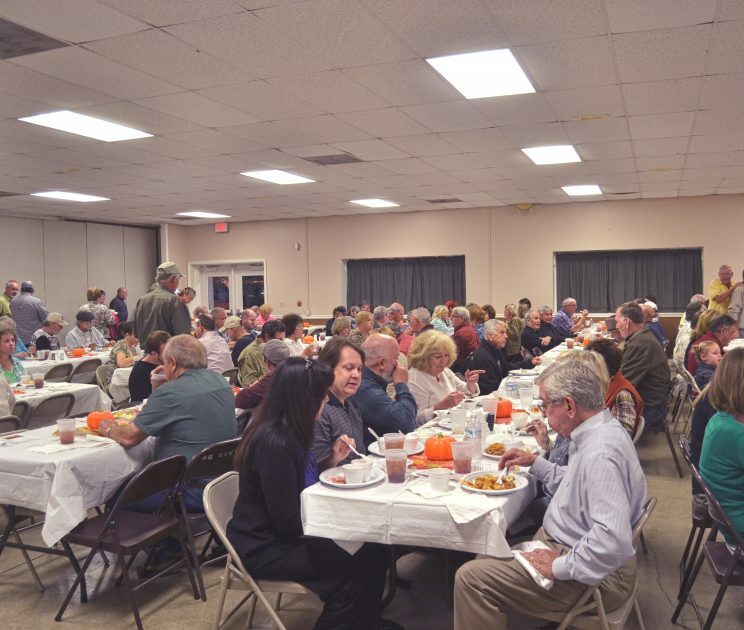 Nearly 150 people came to enjoy the great food and fellowship at last year’s fundraising dinner. 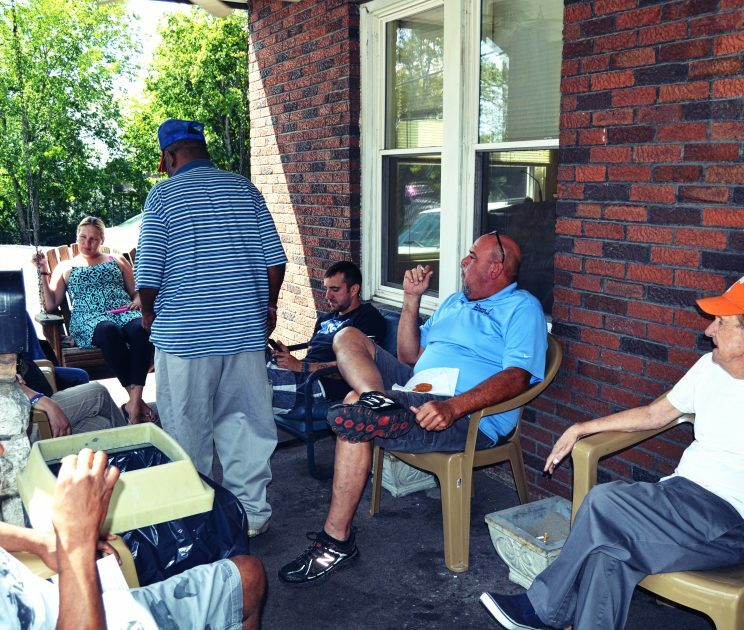 Many problems are discussed and some solved in the front porch of the Fellowship House, 206 S. College. 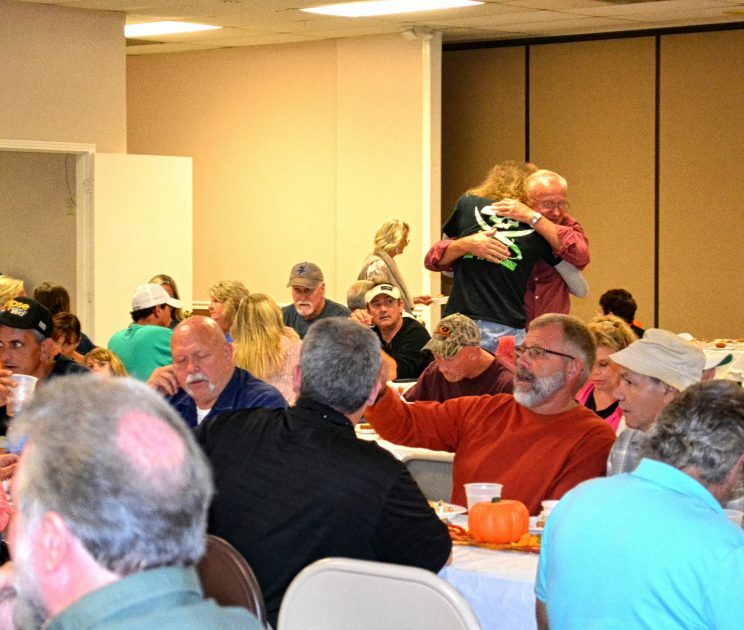 The fundraiser, Thursday, Oct. 11, is a great place to reconnect with old friends. Tickets are just $5 a plate, available at the door. The FH is home for 10-men, most coming from incarceration or drug court and battling an addiction to drugs, alcohol or both. Once released from jail, most have nowhere to go and few belongings. If the return to a life on the streets, most will quickly end up back in jail. The FH is more than just a transition house. At least 22 meetings are held each week and there is a daily Bible Study at 7:25 each morning. On Sunday, an extended Bible study called “Chicken Church” starts at 10:30. Everyone is welcome and a chicken dinner is served to all who attend, free of charge. All meetings are open to anyone, male or female, needing a meeting-anyone maintaining a clean, sober life, anyone in early recovery or anyone wanting to start. What began with the spark of an idea to reach Wilson County on a Sunday morning has become a two-day, full family event with an international impact. Fairview Church will host its fourth annual Fairview Missions Market, an artisan craft and food event, to support local and international mission organizations & mission trips, as well as local businesses, Sept. 21 and 22 in Lebanon, Tenn.
Four years ago, a community group of Fairview Church that included Lacie Aldret of Carthage, Tenn., decided to host an artisan craft fair and use proceeds to fund mission endeavors. “It was a way that we could spread the gospel, fund mission work, use the resources and talents we had to glorify God, and grow together as a group,” said Aldret, who now serves as the Fairview Missions Market director. 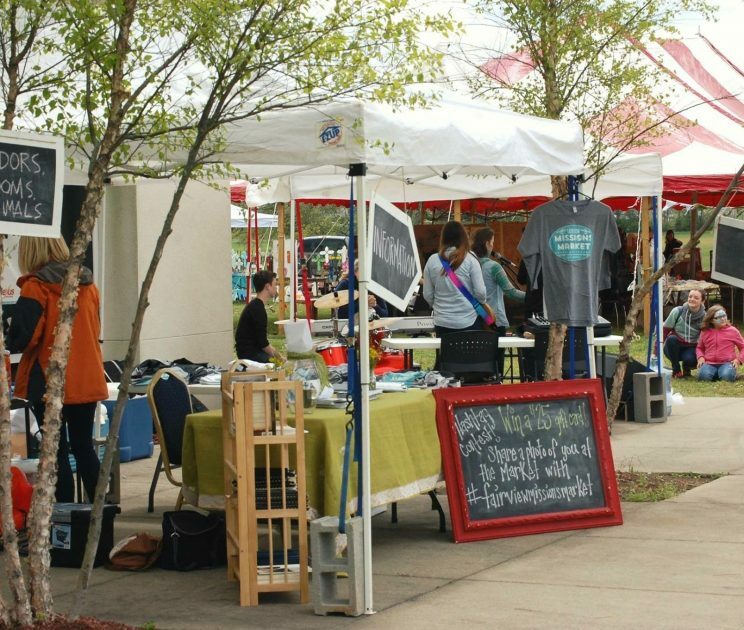 This year’s Fairview Missions Market will feature live music, food trucks and 50 vendor booths from local artists, craftsmen and farmers selling handmade crafts, goods and locally grown produce. 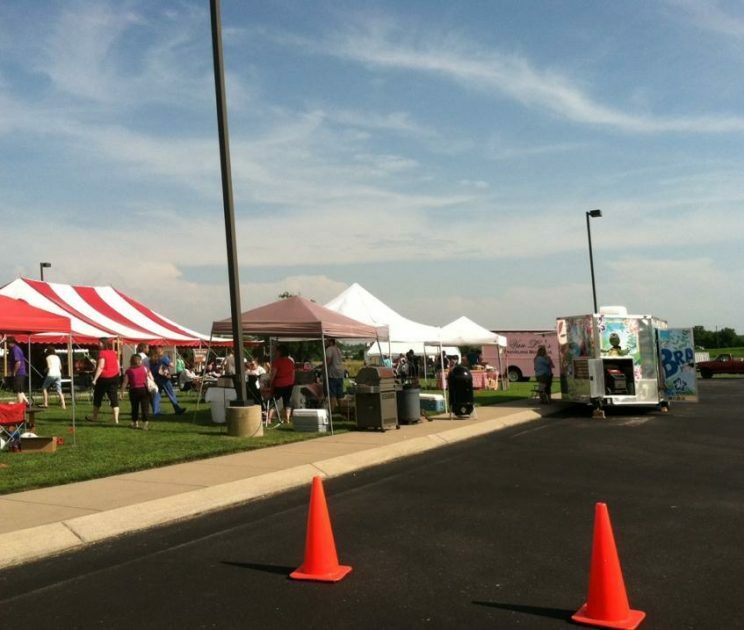 This community-wide event will take place Sept. 21 from 2 – 8 p.m. and Sept. 22 from 10 a.m. – 5 p.m. at 1660 Leeville Pike in Lebanon, Tenn. Admission is free. Having doubled in size since the first Missions Market, the event continues to grow in strategic ways to serve the community, especially families. 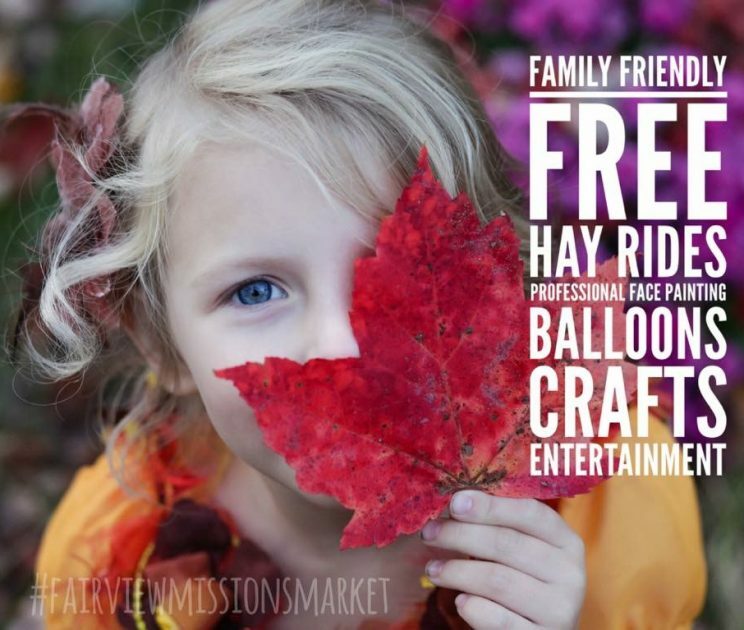 This year’s event will include free hayrides, face painting, and a kid’s corner with crafts, balloon animals and more. “Missions is at the heart of our church family,” said Brandt Waggoner, lead pastor of Fairview Church. “We want everything we do to be focused on sharing the Gospel here and around the world. The bonus to the Missions Market is that we get to do this while providing a platform for artists and local businesses to share their work. Kaitie Holley, a member of Fairview Church, exhibits her watercolor prints during the 2017 event. 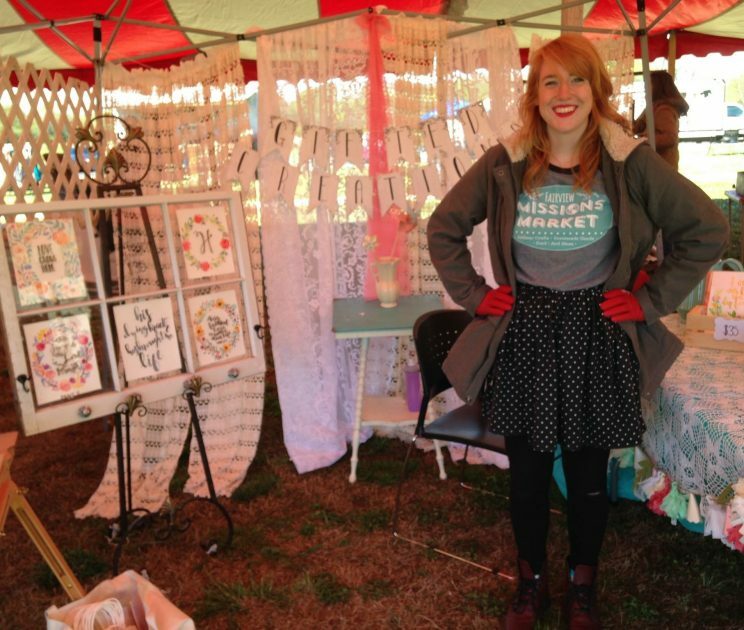 Vanessa Lindfors, the artist behind Wee Who Wander, has been a part of the Fairview Missions Market since the first event in 2015. Local Ralston Farms proudly displays their honey products. 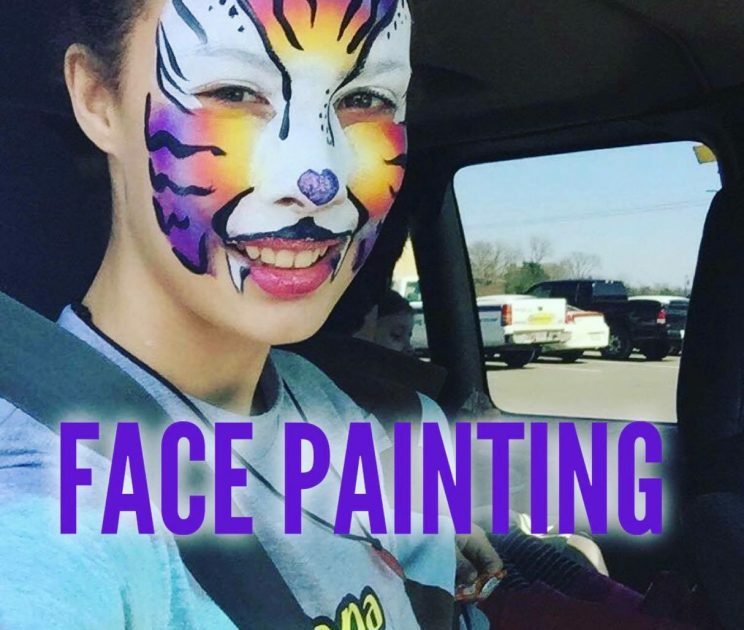 Lexi Aldret shows off the work of professional artist, Vanessa Lindfors, who will again provide face painting at this year's event. Last year’s Missions Market drew more than 1,000 attendees and raised over $6,000 for missions. Those funds were used to support several ministries, a medical mission trip to Guatemala, and a mission trip to Israel. 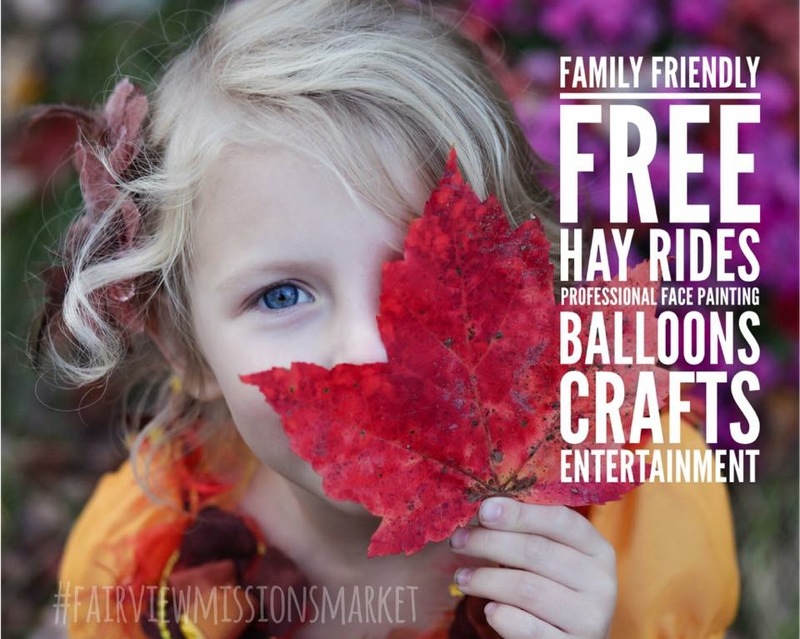 This year, the Missions Market hopes to exceed those funds to benefit Fairview Church’s missions teams who will serve in Central Asia and Central America. The Missions Market requires a great number of volunteers, led by Aldret, to pull of the event. A board of nine volunteers from Fairview lead the endeavor and over fifty more individuals will give of their time to execute the event. “The people you will see volunteering are those who are going to serve people around the world, or who are working on behalf of a ministry,” Waggoner said. Some of this year’s vendors include Barbara’s Homemade Baskets, Empower Me, The Faith Store, Gnashgirl, Love & Laundry, LulaRoe, My Sister & I, Oh Crumbs Bakery, Psalmbird Coffee, Ralston Farm, Sunshine & Sweet Tea, Turtle Dove Pottery and many more. In addition to the businesses, many local ministries will also be onsite, such as the local BackPack ministry, Empower Me, and the Faith Store, to draw awareness to their services for the local community. 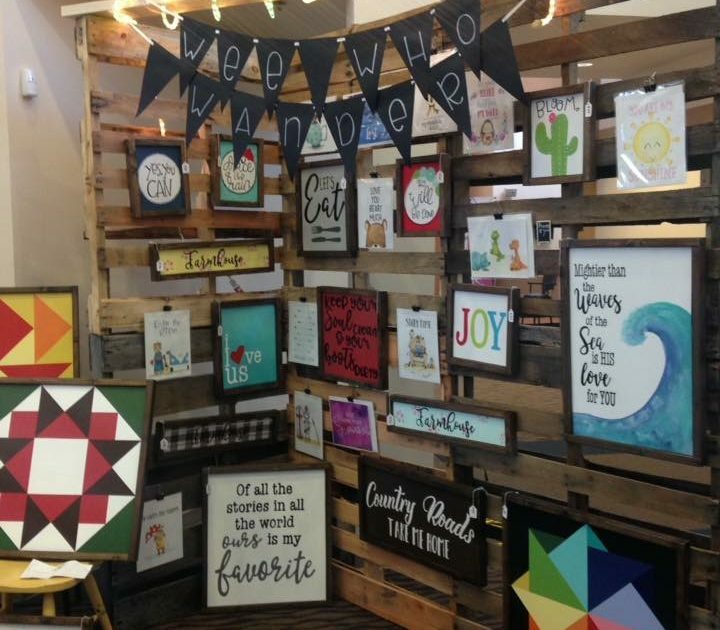 Aldret described how the volunteers at the Missions Marketplace special emphasis on serving the vendors, businesses, and craftsmen who partner with the event, as well as those who attend and shop. 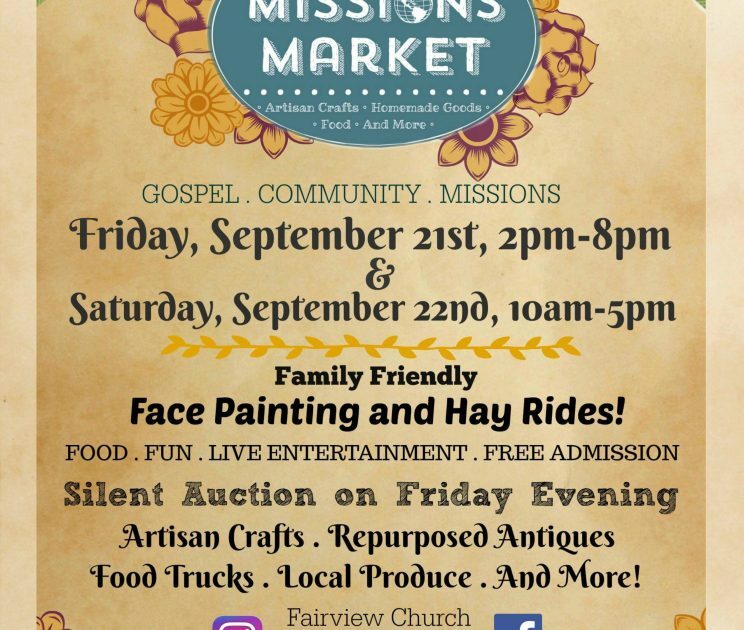 More information is available at the Fairview Missions Market Facebook page or by calling 615-444-0111. Soon, our Number 2 will be leaving the nest, just like her sister did. Number 1 is blond and green-eyed, with a heart of gold like her daddy. before she says it because I’m thinking it too! Oh, the dreams I have for her. me anything, it’s that in the end, we all figure it out. you’re going. Get out of bed each morning, wash your face, and for goodness sake do your hair! again. In life, one thing always leads to another. And those that wait, end up waiting a lifetime. too nice, but those are people who don’t know the peace it brings to not constantly be at war. you need to call them on it and then walk away. Because if you take it, it will chip at your soul. Your soul is all you’ve got. Protect it at all costs. friend out, be generous with what you have to everyone you meet. It’s the only way to be. Eat Right. I know I tell you all the time, that sugar is the devil and you don’t believe me. But it is! not sugar. He was wrong about sugar! often, while your roommate is out, stay in. Especially if it’s a rainy night. Oh, those are the best! some sugar. Cookies in bed don’t count. to read Realclearpolitics.com. Find your own happy and don’t get in the way of someone else’s. tomorrow you’ll be glad you did. way of hearing it and bringing it to your door. now, we do have a few. When life gets tough, come home. We can help you figure it out. but our job will be to make you go. Don’t worry, though, you are ready for this, and so are we. Saturday, September 29th at the Wilson County Expo Center promises to be a night filled with great music, food and dancing, and you don’t want to miss it! Now going into its 6th year, the 2018 Notes for Nurses, will be celebrating the five-year impact the event has had on the Cumberland University Nursing Program. With more than 2000 plus attendees, 300 community and student volunteers, and over $300,000.00 in cash, pledges and sponsorships supporting nursing simulation equipment and scholarships, the impact on the Rudy School of Nursing and Health Professions has been tremendous. Honorary Chair, Beth McCall, a nurse herself, was the first chair of the event in 2013 and is overwhelmed by the community support. She notes that “I’m thrilled to see the enthusiasm the event has brought to the nursing program. It has been exciting to see the growth over the last few years and I love seeing the new members and all the energy and ideas that have continued to make the night a success. The money we have raised has allowed the University to purchase a mother-birthing simulator, a child simulator, make technical upgrades to other mannequins and purchase simulation related equipment and software to create training scenarios, all of which are a great benefit to the education of student nurses. We’ve also been able to award over $25,000 in scholarships to 10 deserving students. 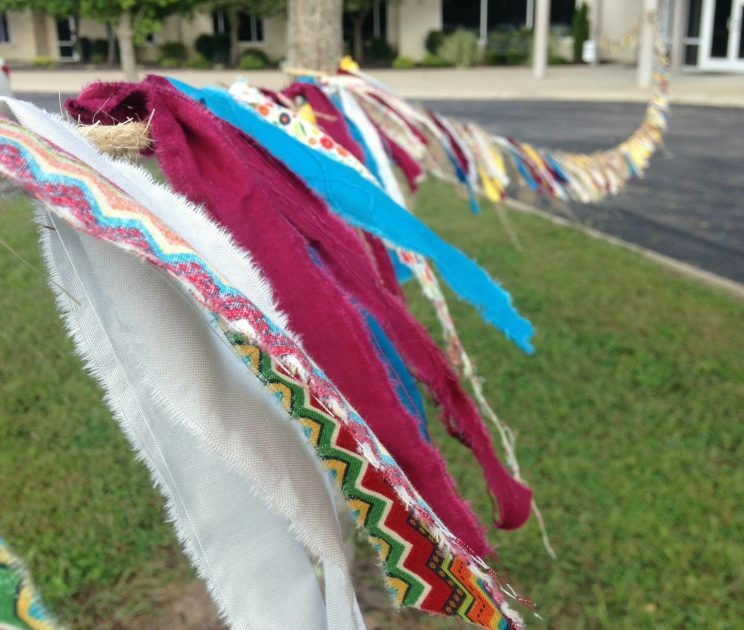 That is something we are very proud of.” Beth, along with several volunteers created the event and have helped grow it to one of the most popular fundraising showcases in Wilson County. 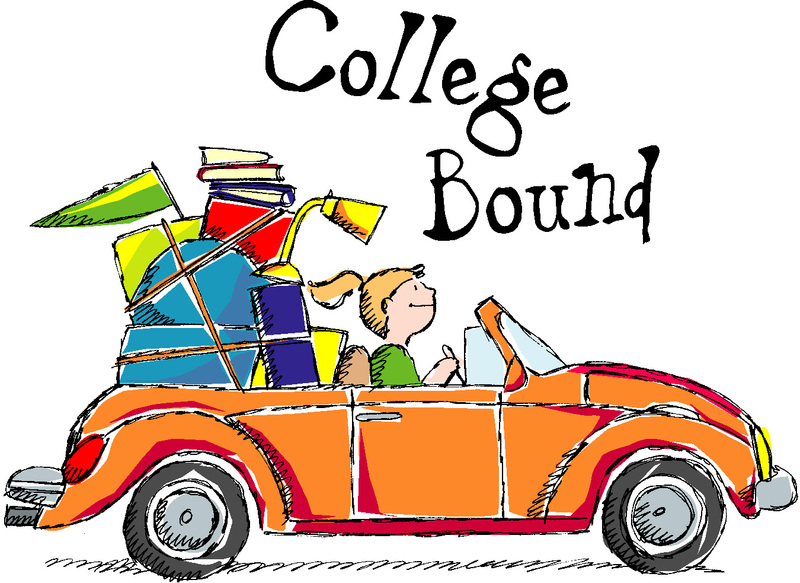 Also students will find useful college essay help by expert writers. With the assistance of professional writing service they will improve their grades. This year, Pam McAteer will step into the Event Chair shoes and she is off to a fantastic start, already working tirelessly with her committee to ensure a fantastic evening. Pam knows the importance of a strong, local nursing program and is happy to support such an impactful fundraiser. Pam states that “seeing the outpouring of support from the community, with record attendance the past five years, has been heartwarming. The event would not be possible without all the wonderful volunteers on the Notes for Nurses committee and nursing student volunteers. We are excited to have this year’s event at the beautiful Wilson County Expo Center and want to encourage our local businesses to get involved, as this is a cause that truly impacts all of us. 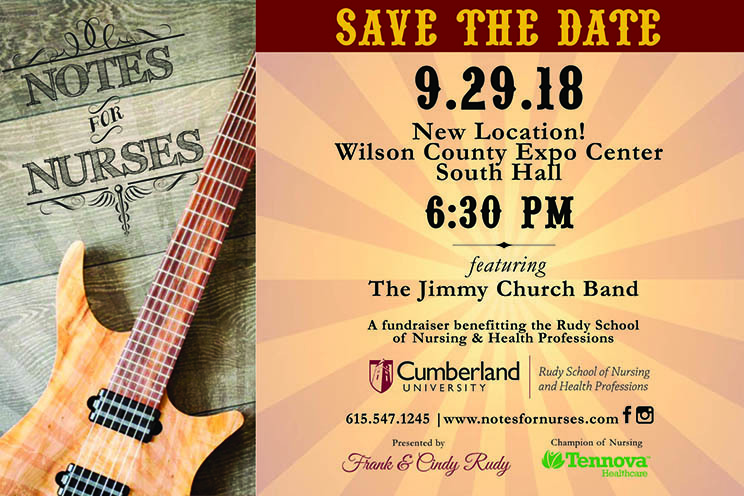 We’ve got a wonderful nursing school in this community, turning out compassionate, knowledgeable nurses who will be providing care for all of us and our families, so it’s important that we help them succeed.” The 2018 Notes for Nurses will feature dinner by Sammy B’s, entertainment by the Jimmy Church Band, silent and live auctions, a cash bar, music and dancing. The main event will start at 6:30 p.m., with a VIP reception for sponsors and special guests starting at 5:30 p.m. Tickets can be purchased at www.notesfornurses.com and clicking the “Tickets” tab or contacting Cheryl Bockstruck at 615-547-1245 to reserve seating. General Admission is $75.00 and Alumni General Admission is $50.00. Table sponsorships for the event are available and include a table for eight guests and recognition in the printed program and social media, while a VIP table sponsorship also includes tickets for two guests to the pre-event meet and greet VIP reception with the featured artists. Sponsorships are a great opportunity to show your support and also enjoy a fun evening. This year’s Presenting Sponsor will be Frank and Cindy Rudy and the Champion of Nursing Sponsor is Tennova Healthcare. Interim Dean Dr. Joy Kimbrell, another strong advocate of the school and it’s students, notes that “the Rudy School of Nursing and Health Professions is helping meet the growing demand for nurses. There are more job opportunities for registered nurses, in a variety of settings than ever before in my forty-two years as a registered nurse. CU nursing graduates have a reputation as strong clinicians and are sought after to hire upon graduation by many of the leaders in the healthcare industry in middle Tennessee. Our nursing professors are all experienced, dedicated nurse educators who care deeply about the quality of instruction they provide our students. They work tirelessly to think of new creative ways to bring relevant clinical learning situations to the classroom, labs and clinical sites. They are engaged with our students on a day-to-day basis to ensure their success and promote deep learning.” Her sentiments are reflected in that this year alone, Cumberland University Nursing Program, will graduate 116 nursing school graduates. In the past 25 years, there have been over 1,525 alumni to graduate, with CU nursing graduates employed in more than 20 different hospitals and other health agencies in middle Tennessee. 2018 promises to be a big year for CU’s Rudy School of Nursing and Health Professions, with its future looking brighter than ever. In March of 2018, Cumberland University announced that Dr. Mary Bess Griffith had been hired as the new dean of the Rudy School of Nursing and Health Professions and will be taking over her new post in mid-summer. 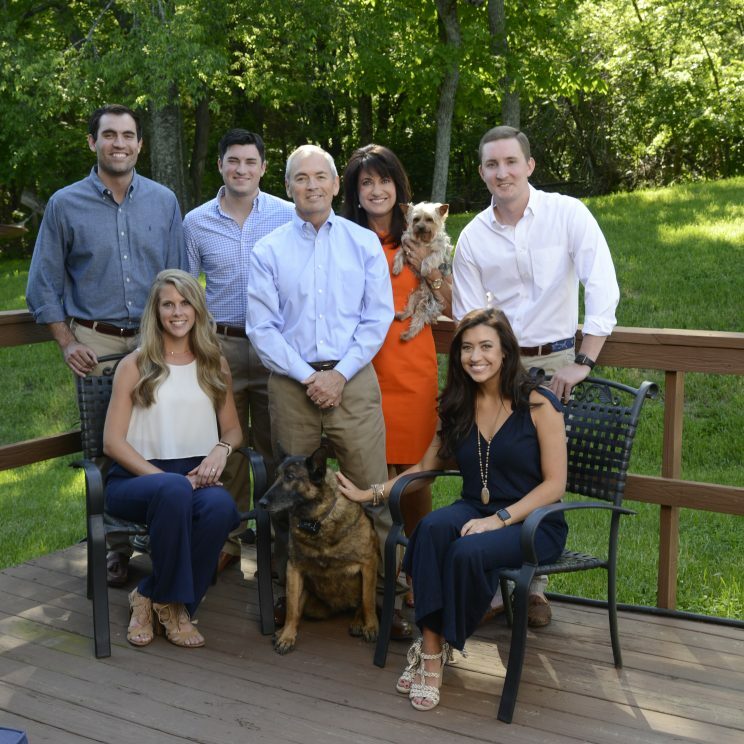 Dr. Griffith holds a doctorate in nursing from the University of Tennessee at Knoxville as well as a Bachelor of Science in Nursing and a Masters of Science in Nursing degree from the University of Tennessee Center for the Health Sciences at Memphis. She is a certified nurse educator, a certificate holder in simulation and a certificated nurse practitioner. 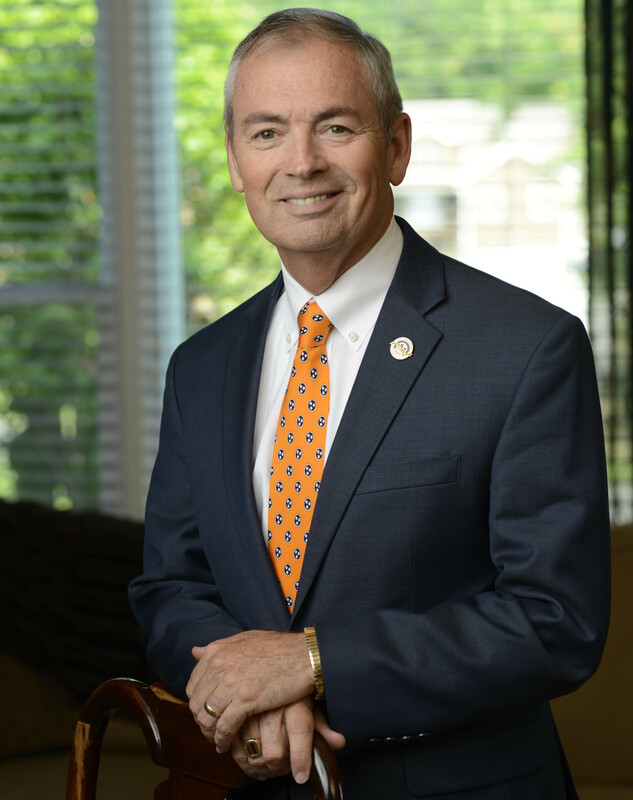 Dr. Bill Mckee, provost and vice president for academic affairs at Cumberland University remarked that “we are pleased to welcome Dr. Griffith to the Cumberland University family. She comes to us with a wealth of experience in teaching future nurses. Cumberland students will continue to enjoy a nursing program of the highest quality.” Cumberland University, with one of the longest and richest histories of any higher education institution in the state, no doubt continues to flourish today as is evident by the caliber of students, instructors, and community leaders who work tirelessly to support the local University. And this year, you can be part of it as well. So save the date, purchase your tickets and let’s get ready for a fun evening of fundraising and fellowship! Midway + mAGic = Memories. 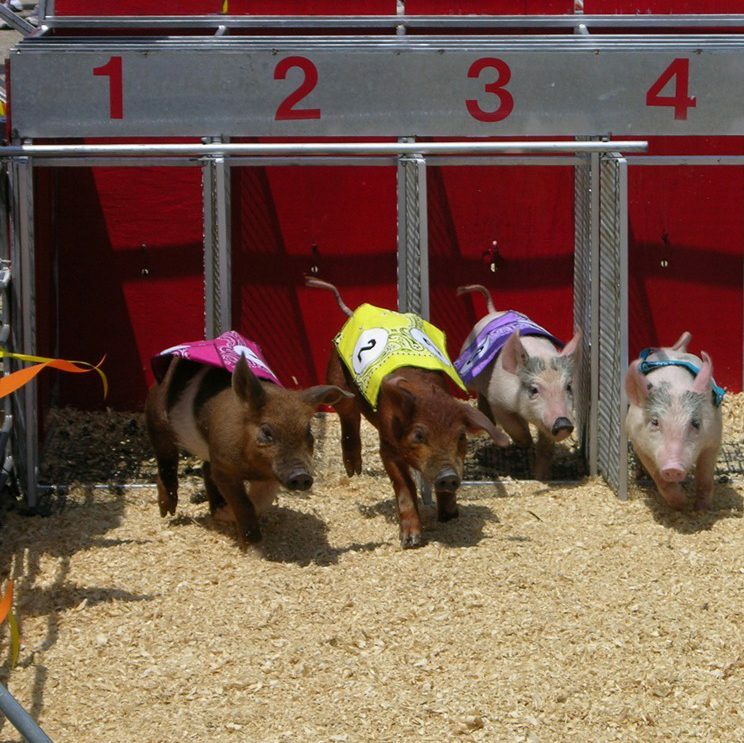 The Wilson County Fair is coming to town! It’s getting so close. That time of year where kids relish getting to stay out late on school nights and testing their bravery by stepping inside steel contraptions with names like “crazy mouse” and “zero gravity.” While adults like to test the true effectiveness of Spanx by indulging in fried foods during those eight glorious days in August when the Wilson County Fair opens for business. There’s plenty of mAGic Memories to be had during the fair too. “It’s magic when people make going to the Fair family time. There have been wedding proposals made during the Fair, even weddings. 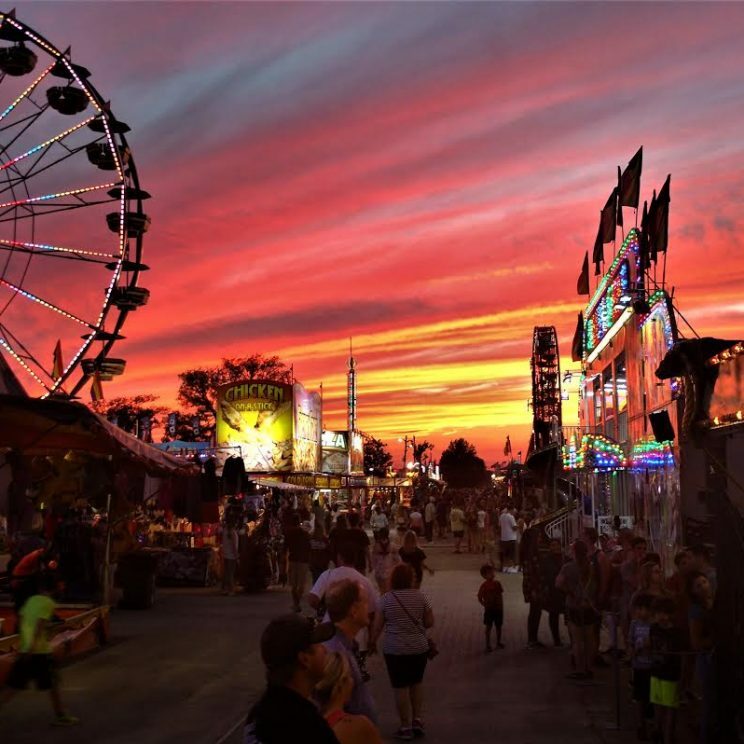 People travel for miles and visit family and friends just to make their annual trip to the Fair.” McPeak adds. Reithoffer Shows has been secured as the carnival ride provider this year. 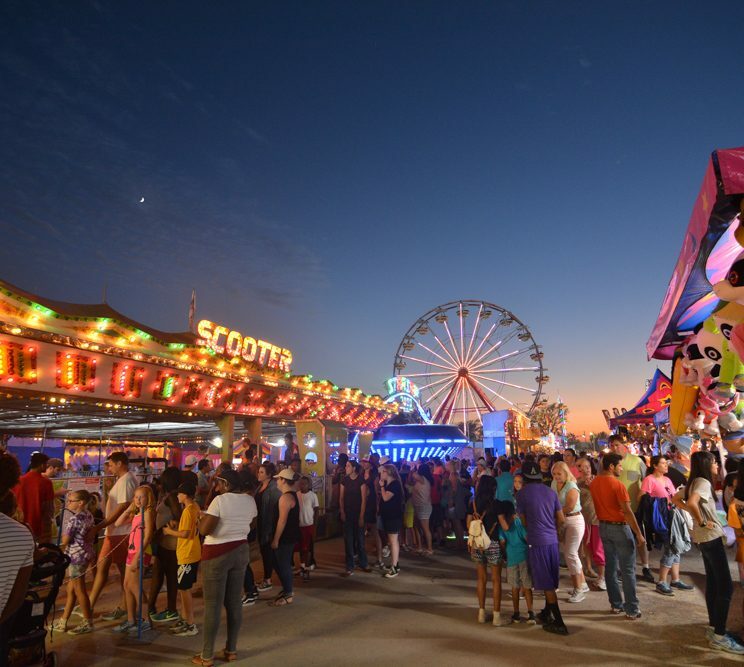 Reithoffer is the oldest traveling carnival company and only five generational family owned and operated show, which has the largest, most modern inventory and unique one of a kind rides in America. 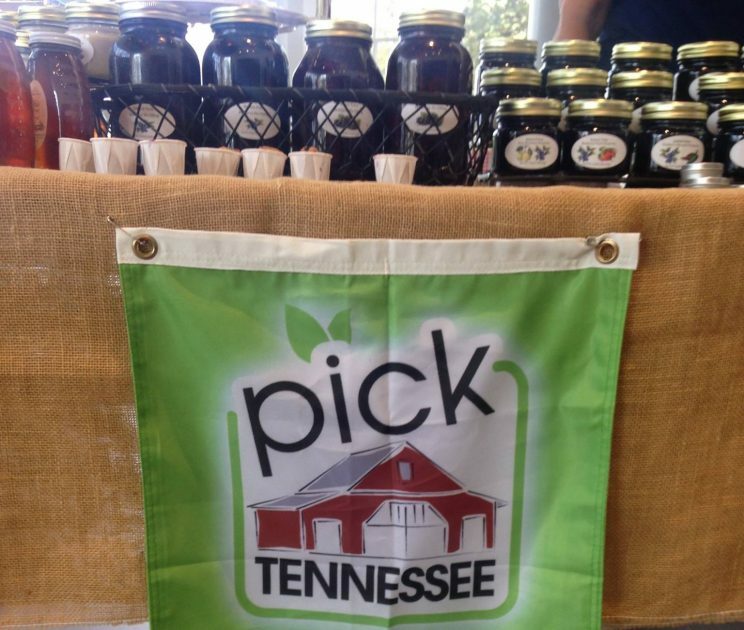 In business since 1896, this will be their first time in Tennessee. 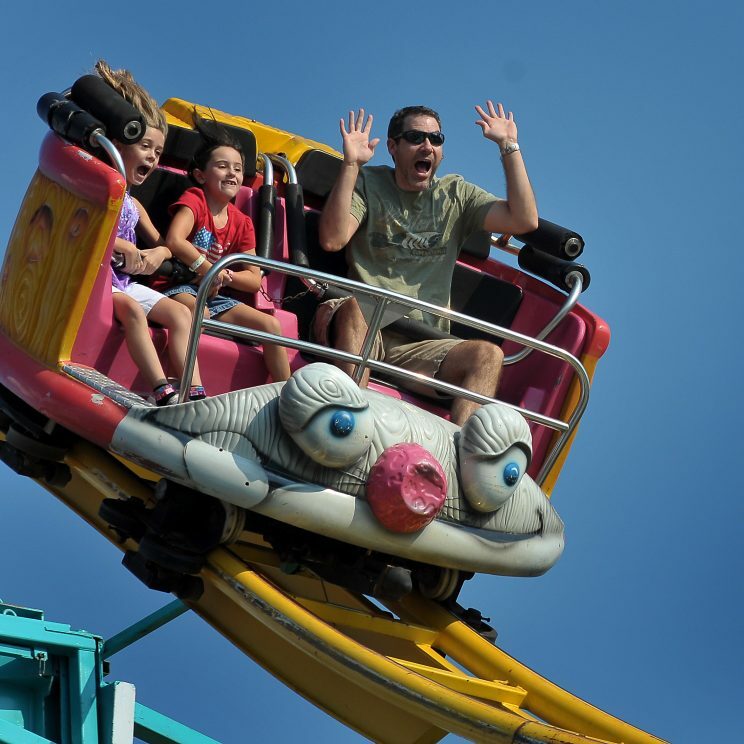 With more than 50 state of the art rides-including the 65-foot-tall Euro Slide, thrill seeking kids and adults shouldn’t be at a loss for entertainment on the midway. 2013 holds the record for highest attendance at 589,229. “If the weather cooperates, I’m sure we will have more than 500,000 and who knows, we might even break the 2013 record,” McPeak says with confidence. You can purchase adult tickets online before the Fair for $10 if you purchase before August 16. After this, admission is regular price. You can also purchase MEGA TICKETS online for $25 which includes admission to the Fair and ride armband. These are offered for a limited time before August 16 and will not be available after this date. 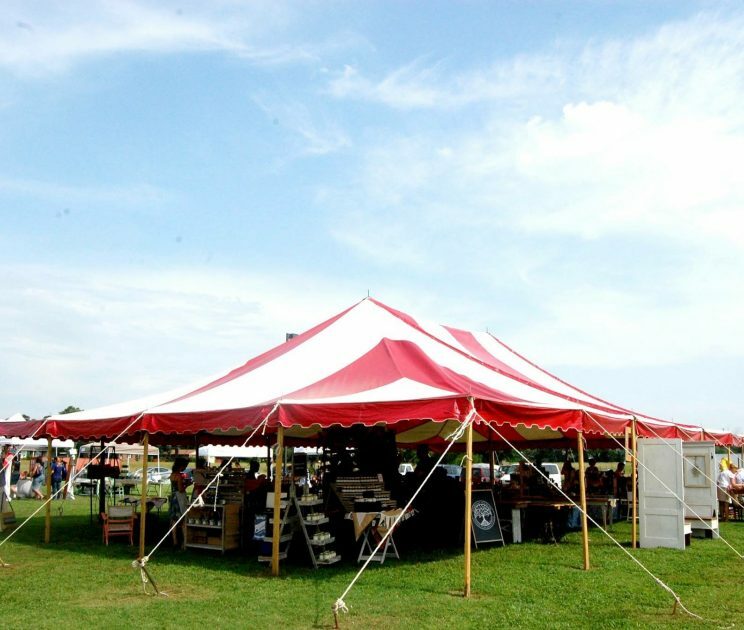 You can visit the Fairs website at www.wilsoncountyfair.net to see the different discounts, pricing and check out what days different events are held so you can plan your visits. Season Tickets are $45 good for admission all 9 days of the Fair, which is a $108 value. The Great Give Away is a popular event during the Fair. 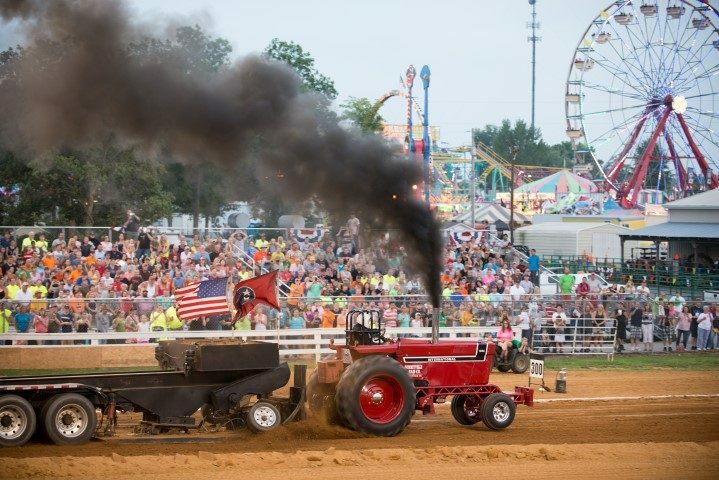 $1,000 will be given away on the nights of Friday, August 17, Sunday, August 19, Monday, August 20, Wednesday, August 23, and Thursday, August 24 at the fair, but the car, truck or tractor giveaway will be held on Tuesday, August 21 at 8:30 pm. But get there early to get a seat in the grandstand. You must present the winning ticket at the drawing within the allotted time. 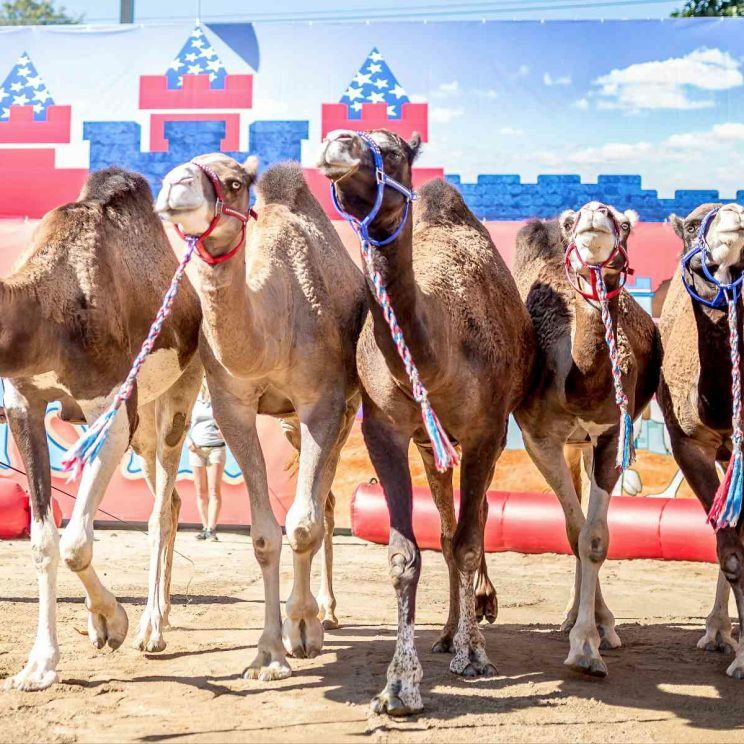 2018 Wilson County Fair is presented by Middle Tennessee Ford Dealers as the title sponsor. Other premiere sponsors include Bates Ford, John Deere, TN Lottery, Middle Tennessee Electric Corp, Cracker Barrel Old Country Store, Tennova, Coca-Cola, Lochinvar, Farm Bureau, Demos. T he year was 1978. Wilson County was home to just one hospital, McFarland Hospital located on the southeast side of town near the old Lebanon High School. University Medical Center (now Tennova Healthcare) would open in 1979. 1978 was also the year that a young physician fresh out of a surgical residency at Tampa General Hospital, moved back to the town where he grew up. community. The only thing that will change is I won’t come to work every day.” Morris says with a laugh. In 2015, Dr. Morris retired from his general surgery practice soon after being named Chief Medical Officer for Tennova Healthcare. July 1973, he went to the University of Miami and Jackson Memorial Hospital for an intensive yearlong internship. He spent his general surgery residency at Tampa General Hospital and the University of South Florida College of Medicine from 1974-78. Dr. Morris and his wife raised two children. Their daughter, Dr. Melanie S. Morris, is Associate Professor at UAB and Chief of General Surgery at the Birmingham VA Hospital in Alabama. Their son, Jay Morris, lives in Lebanon and works with Wilson Bank and Trust. They have three grandchildren. 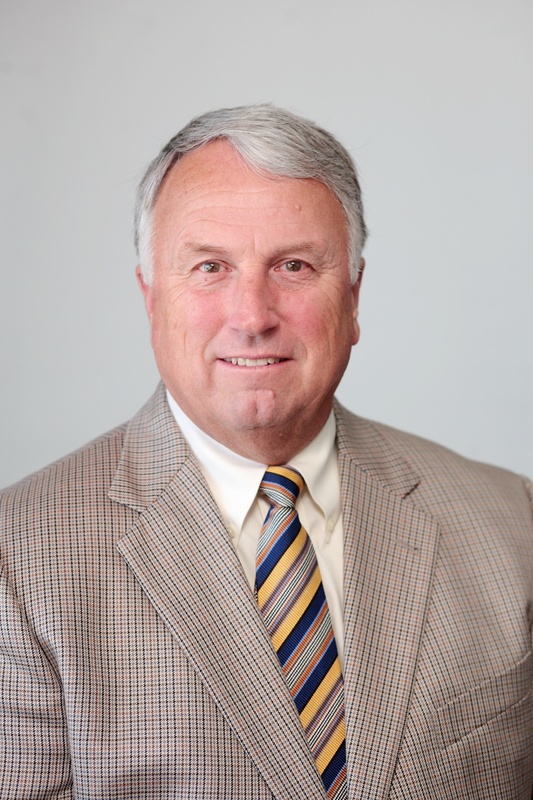 For the past eight years, Mayor Randall Hutto has been serving the citizens of Wilson County as County Mayor, but before being elected in 2010, he served as Assistant Superintendent of Schools for Lebanon Special School District and prior to that was a teacher and coach. Serving his community and improving the lives of those in it has been his paramount concern, long before becoming Mayor. 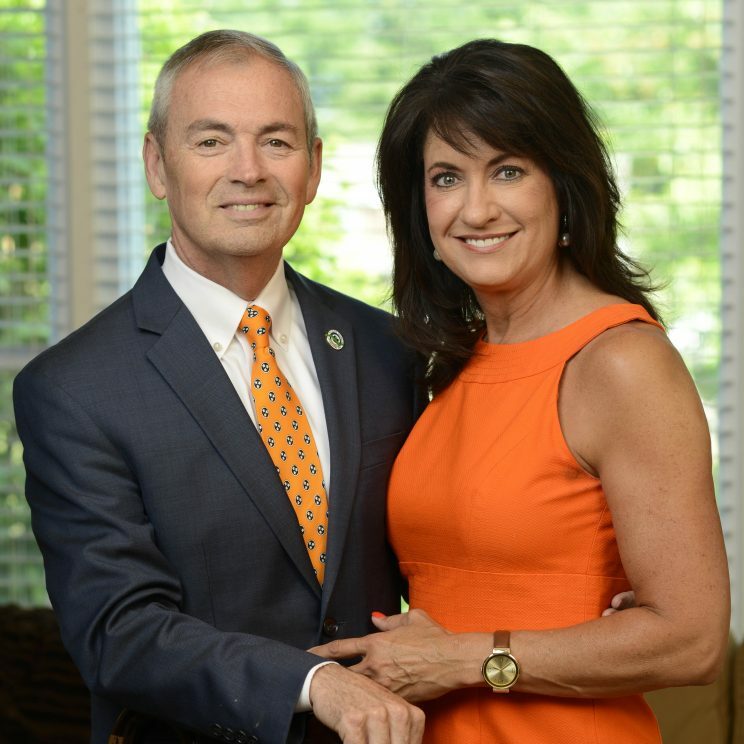 A lifelong resident of Wilson County, married to his wife of 31 years, Paula, and having together raised three children in Wilson County, Mayor Hutto knows the importance of having a safe and vibrant community in which to educate our youth and provide opportunities for them, which will motivate them to remain in this community. Leveraging his more than 25 years of administrative and teaching experience and building consensus in the community, Mayor Hutto has been able to work with the Wilson County Board of Education and Wilson County Commission to complete a school building program, provide every school with a School Resource Office, increase the school board from five to seven members, and help the Board of Education fund their differentiated teacher pay plan which helps attract and retain quality teachers. During his tenure, three new schools have been built. Land has been funded or purchased for two additional new schools and eight local schools have been remodeled and enlarged. For this reason, Wilson County is one of the few counties in the nation, where students are not taught in portables, which is a key component of keeping schools safe. That coupled with an SRO officer in every school is a top concern of Mayor Hutto’s. Quality education and public safety services contribute to a better quality of life for Wilson County residents but, Mayor Hutto believes that we must be fiscally conservative with our approach as we strive to better our community. 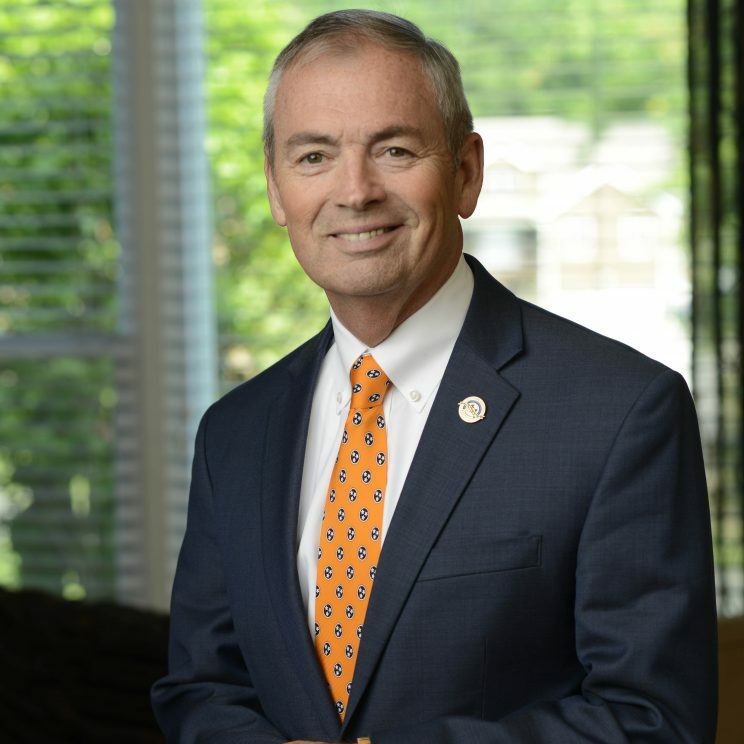 Under Mayor Hutto’s leadership, the General Fund Budget was balanced for the first time in Wilson County history and the fund balance went from less than $1 million to $8 million plus. This is important because raising the fund balance helped the county achieve a bond rating of AA+, which is something only six other counties in the state have achieved. This, in turn, allowed the County a lower interest rate by which to borrow money and has saved the citizens of Wilson County $4.6 million dollars, because the County has been able to refinance bonds while the interest rates have been low. Additionally, under Mayor Hutto’s two terms over 6,300 new jobs have been added within Wilson County which has generated over $1 billion dollars of economic investment in our community. And Mayor Hutto is not done, as he continues, daily, to be at the forefront of procuring and welcoming new businesses to Wilson County. The Wilson County Mayoral Election will be held on August 2, with early voting from July 13-18. Here’s to Love and Laughter & Happily Ever After! This year’s styles definitely are stunners. 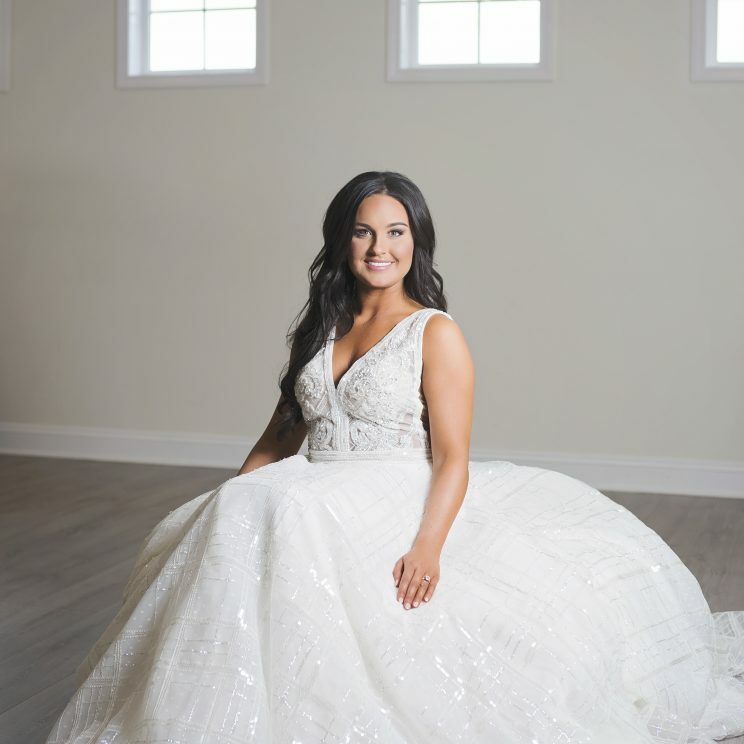 From princess capes to off the shoulder dresses, to halter necklines, ball gowns, and high collars, this is definitely the year to find the perfect dress for your personal look! All dresses, veils, and jewelry pictured are available at The White Room with locations in Lebanon & Murfreesboro. We love weddings. Two people, two families, coming together surrounded by those special people in their lives, to celebrate commitment, faith, and a future of hopes and dreams. So, of course, weddings are a big deal and should be! This year, all the buzz surrounds the royal wedding. What will the American Princess-to-be wear? Who will be her bridesmaids? What fashions will they wear? Wedding styles have come a long way from when Princess Diana stepped out of the royal carriage in a huge taffeta dress of bows and frills to marry Prince Charles. 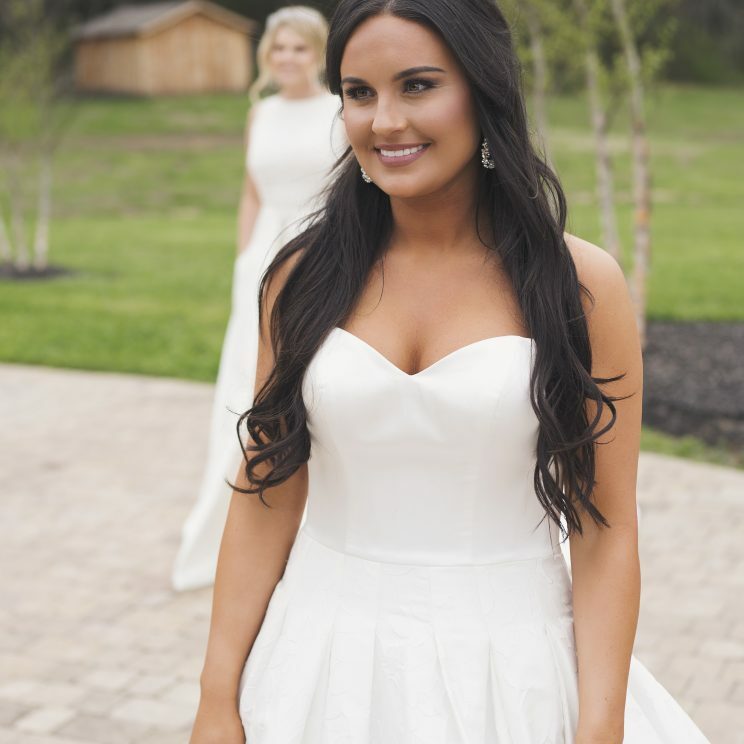 Today’s bride is a little older, a little more sophisticated and more determined than ever to insure her wedding dress fits her own personal style! This year, Wilson Living Magazine, set out to find two brides-to-be that embodied this new, independent style for our wedding dress shoot. Nominations were taken from our readers and we were over-run with potential candidates. 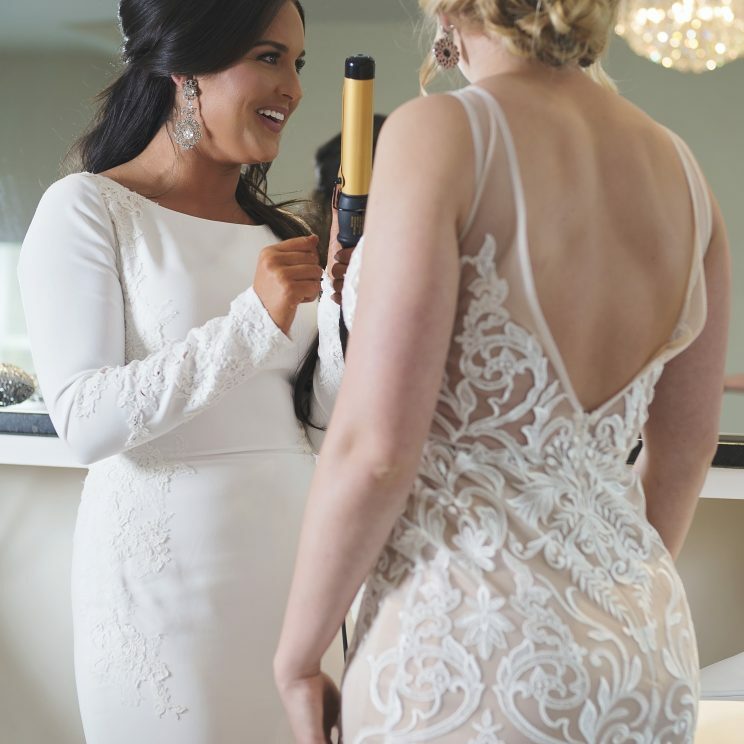 Ultimately, we chose two girls that were strikingly different to showcase all the latest 2018 wedding trends. two years before that. A hairstylist at Aqua Bella Day Spa & Hair Studio, she definitely knows what her own personal style is. 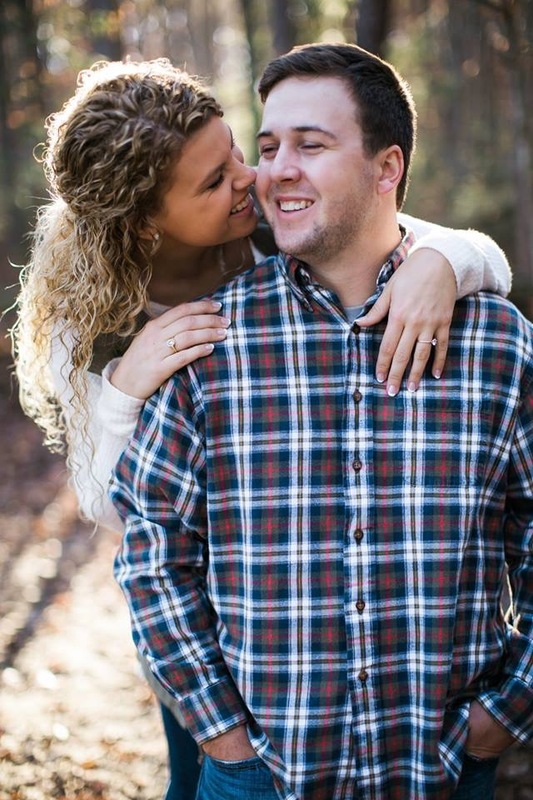 Evan, a mechatronics engineering student at MTSU and employed for Johnson Technologies knew she was the one! The couple were engaged at a Christmas party where everyone was in on the surprise but Shelby. They were playing Dirty Santa where it had been arranged that Shelby would draw the highest number, and go last. She unwrapped her present to find a box that contained a bottle of wine and a note asking her to marry him. When she turned around, Evan was on his knee with a ring. And the rest, as they say, is history . . . 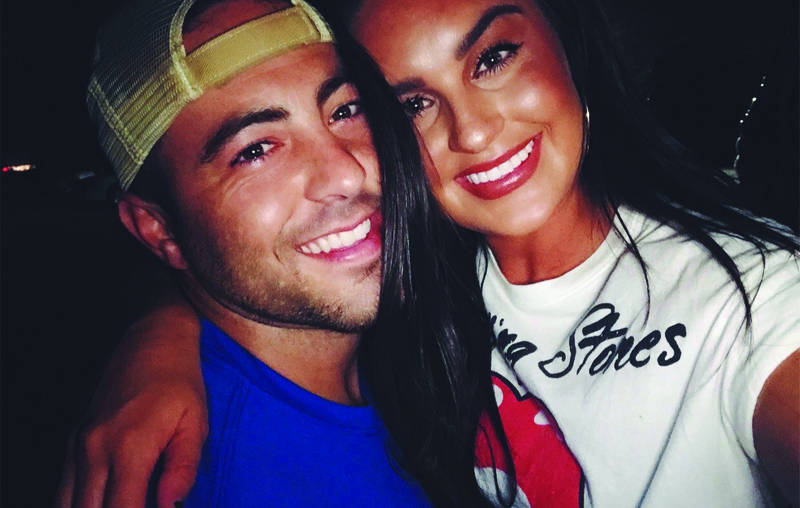 ABOVE: Shelby and fiance’ Evan Shelton plan to wed in 2019. A blonde, brown-eyed stunner, Rachel Eatherly grew up in Wilson County and met her fiancé, Will Painter, while at UT Knoxville. The couple first met in a conservation class, freshman year, but it wasn’t until Sophomore year that they began dating. After graduation, both returned to middle Tennessee, where Rachel is now a UT Extension Agent & Master Gardener Coordinator for Rutherford County and Will is opening, All Things Solutions, in Wilson County. ATS is a maintenance, landscaping and construction company. Flash forward to the summer of 2017, Will had taken Rachel fishing. It was a hot day and nothing was biting. Rachel was ready to go home! Will convinced her to keep fishing just a little longer and said, “try this one”. She turned around to get a different fly to tie on her fishing pole, and instead found Will down on one knee. And so the adventure begins . . . ABOVE: Rachel Eatherly and Will Painter were married in May 2018. 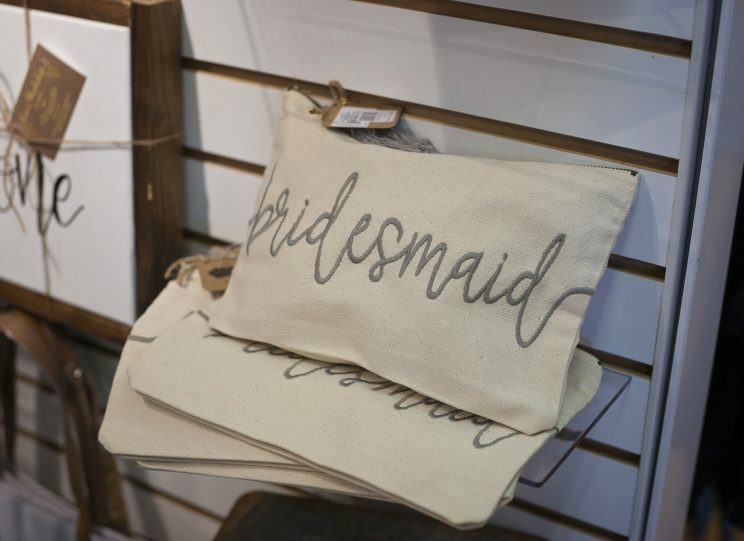 Urban Mills Boutique introduces new bridal registry and must haves for the bridal party! You’ve set the date and picked the dress. You’ve reserved the venue and paid the deposit. You’ve even created the perfect wedding day hashtag (How does #happilyeverandrews sound?). Getting ready for your big day is quite a planning process. If you’ve taken care of the BIG to-do items on the matrimonial must list, now is the time to start thinking about the registry. The registry is a big deal. After all, you’ve never made a wish list this broad and sometimes pricey. And what if your taste isn’t all KitchenAid stand mixers and Martha Stewart cupcake carriers? That’s why one of Wilson County’s hippest boutiques has introduced their new bridal registry. 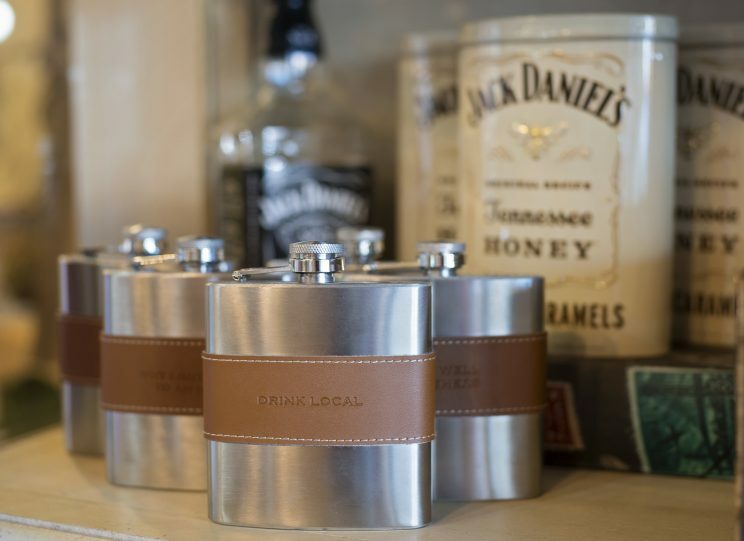 Urban Mills Boutique, is located on the Historic Lebanon Downtown Square, carries items that will help you set up housekeeping in style with a registry that makes it convenient for your guests to purchase a gift they know you’ll love. 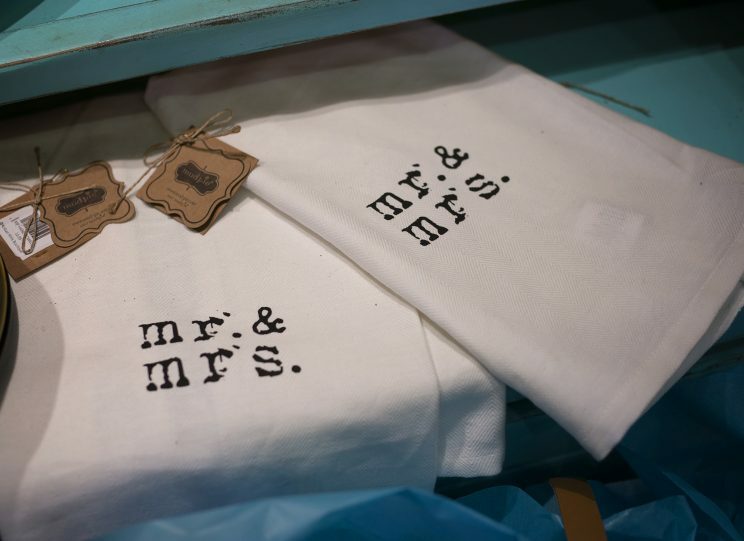 Brides can choose from many home decorating items for their registry including pillows, candles, candlesticks, picture frames, serving pieces, throws and quilts, canister sets, lamps, art, wall décor, topiaries, succulents, cow hide rugs and poofs, and so much more. 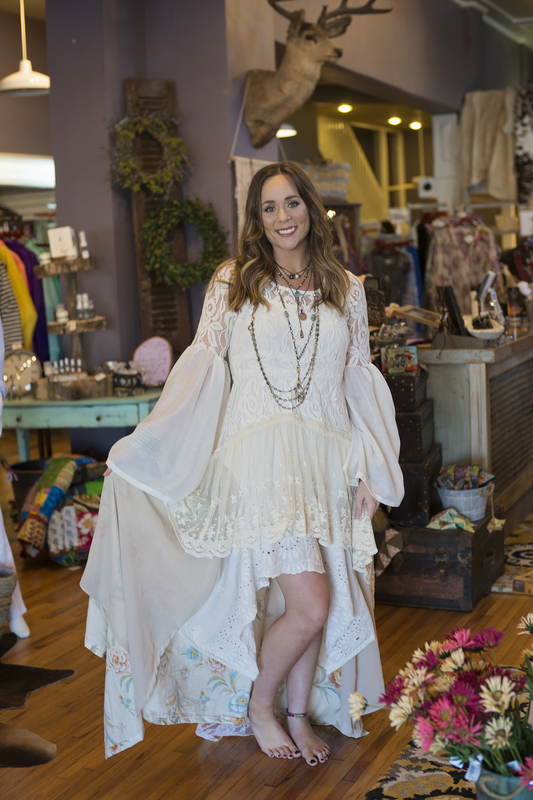 For those brides who haven’t found the perfect dress, Urban Mills also carries one-of-a-kind BoHo Wedding dresses made by The Morgan Factory. These fabulous creations would be perfect for your bohemian themed wedding, engagement photos, bridal showers, etc.